Excuse me, can I tell you something? Mom moments celebrating God's grace in the little things to someday be included in a new book called "ADVENTURES OF A HOTT MAMA!" I want to hear about your special fury friend too. (Thanks for reading. And, please share, maybe someone will sleep a little better tonight!" Kinda excited about this article! It's about our Chocolate Lab, Hershey!....Check it out here, and please do share on the article about your special pet too! Your Turn! We're Counting "Blessings"
parkinsonsdisease.net graphic of Pap singing "Showers of Blessings"
Sometimes we need to look really hard, right? That's why I am excited to share my last article from ParkinsonsDisease.net. Check out the super cool picture of my Pap singing that old time song "Showers of Blessings" then click on the link to connect both to the article and, a storm of blessings and connections waiting for you. A Levi Hott Film...from his youtube station. 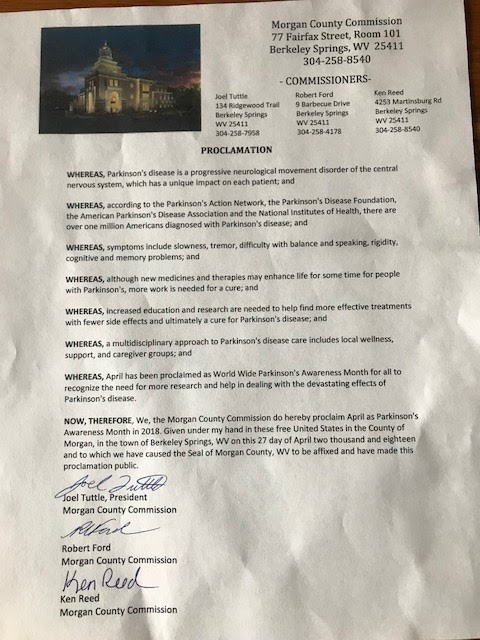 Joining the nation in an effort to raise awareness for those living with Parkinson's Disease, Morgan County, WV, proclaims April 2018 as "Parkinson's Awareness Month"! Thank you to the residents of this county for supporting the Hott Family! 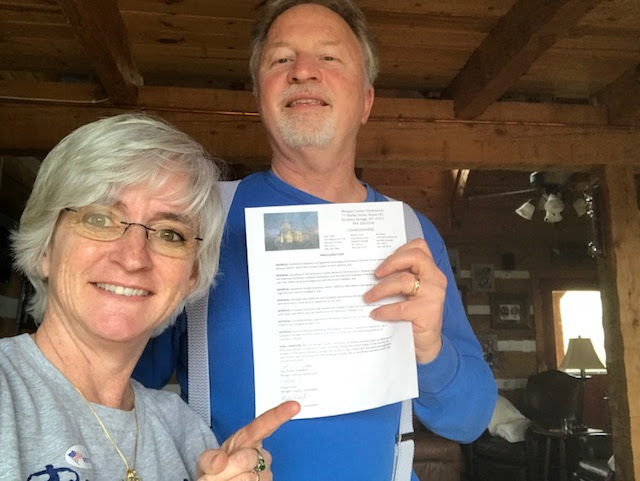 As we personally advocate for federal funding for research with the Michael J Fox Foundation for Parkinson's Research and the Parkinson's Disease Foundation, Dan and I are happy to share our community's Proclaimation of support! Thank you Joel Tuttle, President of the Morgan County Commission, for placing this on your busy agenda! Pretty cool, right!?! I can't wait to show the students in Positive Actions this beautiful example of a community that cares! Link above published today on HealthUnion.net! Check it out! Sharing the above article that published on Health Union's ParkinsonsDisease.net while Violet and I are attending the Parkinson's Policy Forum in Washington, DC. Today, March 21st, is Parkinson's Advocacy Day where 300 people from across the country will contact our Members in Congress to fund critical research for NIH and DOD. More cool news to come! Subscribe To "Excuse me, can I tell you something?" Excuse Me Can I Tell You Something? Warning! Don't Read Today's Column "Fifty Shades of My Gray Hair"!